The Dolmen Centre Swimming Pool sub-committee made a presentation to the Glenties Municipal District Councillors on Tuesday last, where they outlined their plans and progress to date, in the provision of a Swimming Pool for the area. Tony Kitterick and Leonard Molloy, gave a brief history of the Dolmen Centre, how a Community questionnaire rated a Pool as a top priority for the area back as far as 1994. 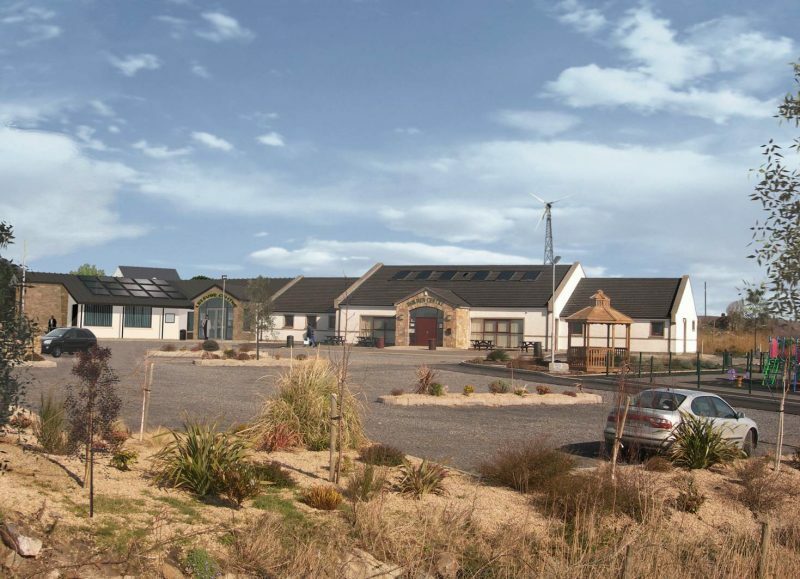 They showed how they had been working with Donegal County Council (DCC), to select a Design Team, through a Public Procurement Process, and had selected Quilligan Architects to deliver this. At this point the Design Team have indicated their preferred site location for the Pool (behind the AOH hall) on the west of the Dolmen Centre site, and given indicative costs for the 1,053sq metre building at €3.3M. Furthermore, a limited company to be known as “Dolmen Leisure Ltd.” is being set up as the vehicle to deliver the Pool to the area. The group are also in discussion with the EU Unit of DCC to find like minded partners to deliver a ‘Carbon neutral Pool’, which could become the template for public Pool provision in the country. This process looks likely to team the group with ‘Arctic fringe’ countries, where high insulation and low carbon technologies are to the fore. It is hoped that the knowledge garnered from these partnerships, can be utilised in the construction and maintenance technologies that will be used in the Pool development, should monies become available. Cllr’s Slowey and Bonner spoke of their knowledge of the hardworking committee in the Dolmen Centre, and their track record of project delivery, and commendable history of clearing their debts within very short periods of time. Of the 5 area Councillors present, there was unanimous support for the unique project, and the group were invited to come back to the Municipal meeting to advise of their progress. It is hoped that this will happen sometime in 2017. Note: the featured image is Tony Kitterick’s ‘Artist impression’ of how the finished building will incorporate into the existing Dolmen site.